I’ve pretty much been wearing plaid every day. And I should probably find something other than plaid to wear since it’s not like I don’t have other clothes in my closet to wear. Never been one to fully master layering, I figured if was going to put on another button-up shirt, maybe I should break it up somehow. Instead of a chunky knit sweater, I tried out this sleeveless peplum shirt from H&M, and there you have it – the outfit I wore to take Nathan and Landon to visit Santa! Yes, I already took the boys for their first Christmas photo with Santa about a week ago. And yes, I am that mom. No way was I going to brave doing this on Black Friday, or really, any weekend after that considering the mob scene the mall turns into. Moms out there know what I’m talking about – I’ve got potential diaper changes in the mall and a feeding schedule to contend with. Early it is. 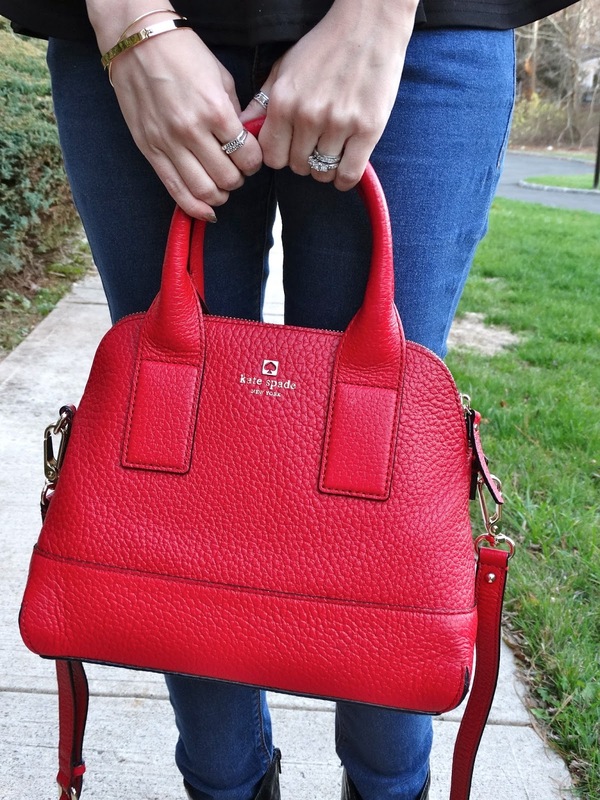 And since we’re getting all festive, I’ll be rocking this perfect Kate Spade New York Southport Avenue Handbag that I got for my birthday! It’s actually called the Jenny (not the reason I wanted it), and if I do say so myself – it fits my style personality. It’s bold, and different, yet can become a classic wardrobe piece with extreme versatility. Since I opt for darker colors to incorporate into my wardrobe, I’ve found having a red handbag to be extremely inspiring in terms of finding new things to pair it with. Hope you all enjoyed Thanksgiving, and better yet, took advantage of those killer Black Friday sales! Onto Cyber Monday! If you need me, I’ll be stalking Instagram and cleaning out my email from the 200 emails an hour I’m getting because of it.